Always a blinding, shaking, soul-blast of sweaty good times, Blues Explosion is the right mixture of punk and let it all hang out early-70s hard rock. Even if they donâ€™t know how good the first Cactus album is. 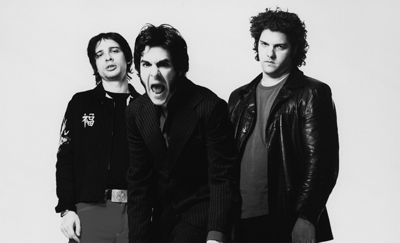 Jon Spencer: Heavy rock? Whatâ€™s heavy rock, Nickleback? JS: Yeah, Iâ€™m sorry [Laughs]. Weâ€™ve got our share of crappy bands. JS: I must say Iâ€™m not familiar with Cactus. ONLY: They were a spin-off of Vanilla Fudge. JS: Iâ€™ve definitely heard Vanilla Fudge. Yeah, thereâ€™s a lot of bands that sound like early 70s, certainly a lot of bands that look like that, too. ONLY: I think that what you do has a lot more of the soul that music had, blues and soul elements. Less hype, more mojo. JS: Well, thanks. I guess weâ€™re into a lot of different kinds of music and maybe that has something to do with the difference between us and these other groups. For me, I really believe that rock and roll is something strange, yâ€™know? And it really is. And I think thatâ€™s sort of lost on most people, and I think thatâ€™s what sets the Blues Explosion apart from a lot of bands. But I do think that rock and roll is something thatâ€™s from outer space and itâ€™s meant to be a bit strange and a bit bizarre. To me nothingâ€™s more tedious than â€˜Rockâ€™. Itâ€™s rock and roll. ONLY: What kind of strange music attracted your ear? JS: Oh, I got into bands like Kraftwerk and the Residents. Very kind of un-rock and roll bands. Now, with my experience and knowledge, I can point out the rock and roll within the music of those bands. Itâ€™s definitely there. On the surface they were very different from the music that was around me when I grew up. ONLY: Like Aerosmith and that? ONLY: I can hear a lot of similar mojo in Aerosmith when they were good with what you do. JS: Yeah, yeah. Youâ€™re never too far away from anything else. Things are all connected in some ways. ONLY: You both like the greasy beats. Itâ€™s neat what youâ€™re doing now, adding all kinds of today-twists to it but still keeping it raw and loose. Does the looseness come a little easier? JS: Weâ€™ve never used a set list and we always keep things open. We always take chances live. Thatâ€™s the fun of it. We just finished a three-week tour and only in the last few days have we really started to nail certain songs. There were some things which weâ€™d been kicking around which weâ€™re finally able to play, and itâ€™s always great when you discover a cool segue between two songs or three songs; something new just kind of popping up. I think the model for us is James Brown or Black Flag. You listen to James Brown live recordings from the 50s, 60s and early 70s; also, bands like the Famous Flames and the lineups with Bootsy Collinsâ€”a real rhythmic influence. ONLY: A good old ten-minute song? JS: Oh yeah. You should check out the live record Live Power Peace, or Love Power Peace, from 1968 recorded in Paris. Thereâ€™s some incredible sequencesâ€”thereâ€™s some vamps that go on for a very, very long time. And thatâ€™s just classic showmanship. Reading about those performances and listening to them, thatâ€™s really a model for Blues Explosion in many ways. Weâ€™re certainly not a jam band. We donâ€™t use a set list, but weâ€™re not noodling around. Itâ€™s like a kind of punk rock soul show. Weâ€™ll hang on to things if the moment calls for it. And itâ€™s not only about the band, itâ€™s everybody and what people are doing and what the feeling is. ONLY: From the shows Iâ€™ve seen you get a lively crowd. JS: Thatâ€™s one think I like about our music is itâ€™s a communal thing, it can be. Rock and roll, thatâ€™s my church [Laughs]. Blues Explosion play with the Gossip at Richardâ€™s on Richards on Thursday, Nov 18.